I’ve been taking Raven out regularly, trying to vary up our destination a bit to keep things interesting. Some days I’ll take her down the road, sometimes to the north, others to the south, to one of the spots I feel comfortable letting her off-leash. Since the lake has been frozen, another option has been trekking up the ice to the north. I’m sure to the south would be fine too, but I feel less confident about the ice in that direction; I’m not sure why, we’ve had sub-freezing temperatures for a good long time now and I suspect the south would be just as frozen solid as the north, but I still avoid it. The same with going straight across; there’s a channel down the centre where the water flows in the old riverbed (going back a hundred years, originally it was a river that ran through a valley here, and when it was dammed it created the lake) that tends to stay open longer than surrounding water, so I’m nervous to venture too far out that way, either. However, that didn’t stop these intrepid creatures. 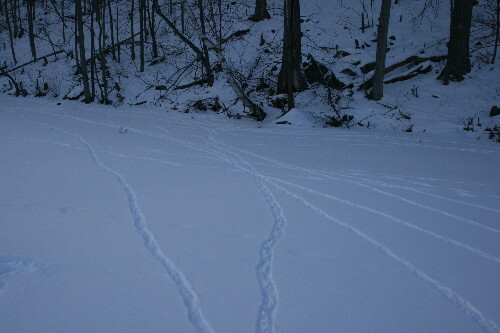 Normally I don’t see any tracks on the lake when I take Raven out, except perhaps our own from the previous day or two. 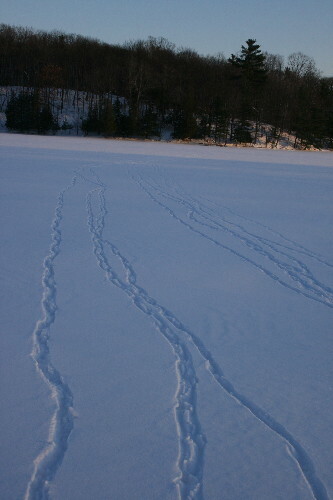 But the other day I found this set of tracks heading boldly out across the open lake for the park on the far side. I hadn’t seen the animals that made them, and there weren’t any clear footprints in the half-foot deep soft snow, so I couldn’t decide what they may have been. I counted nine separate tracks heading over the otherwise unmarked snow. Looking back in the other direction, the tracks meandered along the shore a little ways, following the contour of the ridge before popping up onto the land where the topography was gentler. Actually, when I paused to think about it, I couldn’t tell if the animals had been coming from the park or headed for it. The animals seemed to move along together, in a group, as best as I could tell. There weren’t any strong clues to the identity of their makers there, either. 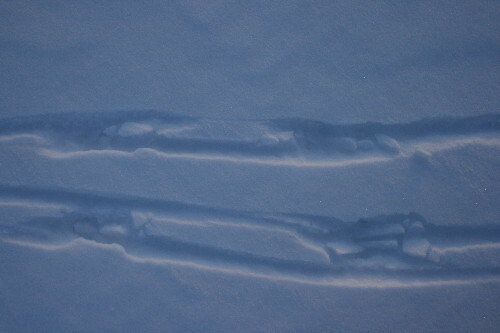 This is the tracks from two of the animals close up. I couldn’t see any evidence of paw prints, cleft hooves or toe tracks, but it did seem like the animals were dragging their feet. They also looked like they had toes that left marks in the snow as they dragged them over the surface. I wondered about the possibility of deer. I’ve often see deer drag their feet, resulting in similar markings from their cleft hooves. Usually, though, you can see the hoofprint in the tracks, and the footprints are more separated. I haven’t ever seen a big group of deer around here, either, only twos or threes together. Muskrats maybe? But I haven’t seen a muskrat in months. So I wasn’t sure. Further into our walk I came across the same sort of tracks again, only this time up in the forest. They seemed to be wandering around a young sumac patch, and I could see where they had been eating the sumac berries. The footprints were no clearer, but the way the tracks milled about suggested the animals were browsing there for a bit before they moved on. Deer again crossed my mind, but I figured I would be likely to see some nibbling at the soft fuzzy bark of the sumacs’ young trunks, which I didn’t. Such a mark could only be left by a bird, as it either arrived or departed into the air. 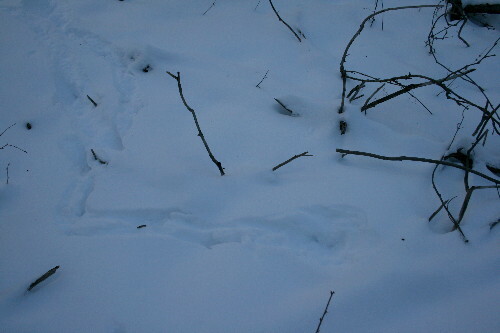 And tracks this size could only be made by one bird: Wild Turkey. It then made sense that there were nine tracks out on the lake – when we had had the birds visiting our feeders before Christmas, there were nine of them then, too. Here’s another spot where the bird either arrived or departed. Birds, being the only animals that can get airborne, are by extension the only animals that can create dead-end tracks. Except for mice or voles, which can disappear into a tunnel, but then there’s an obvious tunnel entrance at the end (or beginning) of the tracks. These tracks were a bit further on, in shallower snow, and I was able to pick out some turkey prints among the shuffling in spots. Interestingly, nearby there were also clear deer tracks, and a couple spots where the animals had nibbled at the bark of young saplings. These were left at the side of the road, the day after a snowfall, after the plow came by but before the snow had melted or hardened into ice. I love that you can see the individual segments of each of the toes, you can almost picture their thick, leathery appearance. 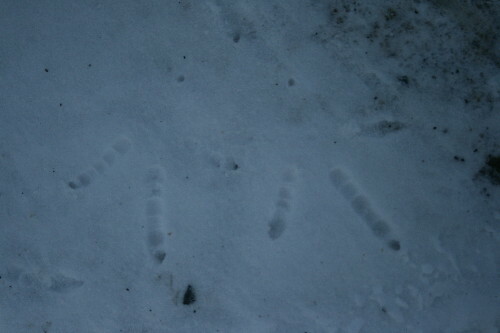 You can also see the deeper holes at the tips of the toes where the stubby claws dug into the snow. 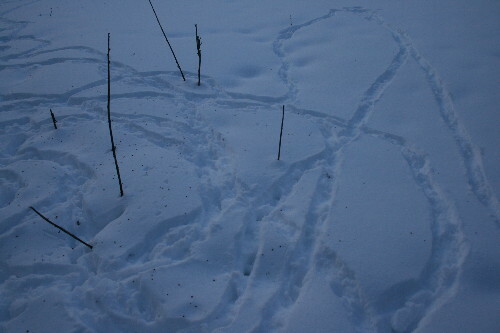 Tracks in the snow are interesting to contemplate. In the summer you rarely get such a peek into the activities of animals as they go about their daily routine, but in the winter, they leave a record of their wanderings in the snow, and often even suggest what they may have been up to, such as with the sumac berries. Next up are a few more tracks belonging to other critters. What a fun mystery. I enjoyed following their trails with you. Because I read this entry via the blog surfer, I didn’t have the help of the tags that appear on the date line. Even at the fifth photo, I got it all wrong, thinking it was some mammal that had been carried off by a pouncing raptor. I really enjoyed this detective story! Neat story. I see turkeys on the lake ice regularly. While they are always crossing and don’t seem to linger, it still seems like a risky proposition as we see flyovers by Bald Eagles almost daily. Do you think an eagle would take a shot a a turkey? Great story. I enjoy the mystery of tracks during a hike too. Great post! And so fun to see how you solved the mystery! 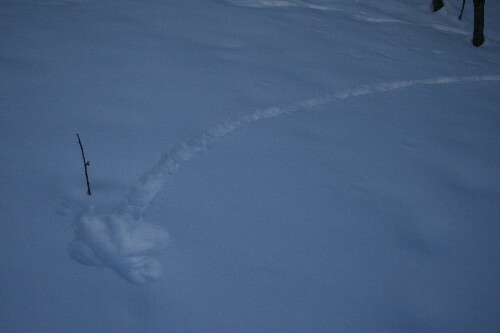 That’s one of the reasons why I love the snow so much – reading tracks and solving the mystery of who does it belong to. Can’t wait for more! What fun – I never would have guessed. A great adventure, and I particularly like the “footprints” in the last photo. Thanks for the comments, all, I’m glad everyone enjoyed this post! That’s a good guess, Lavenderbay, something that didn’t even occur to me but would have been a valid possibility for the fifth photo. Hard to say, Michael, a turkey’s a pretty substantial bird. Possibly a starving eagle and a small female turkey? Regardless, it does still seem rather bold of them to venture out onto the lake where they’re so exposed.